Look to these digital-friendly tools for a modern complement to cardiovascular care. Continue reading below to discover how you can use these mobile apps and gadgets to improve heart health for you and your patients. 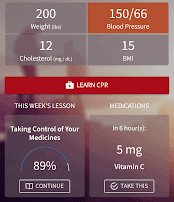 Developed by the American Heart Association, My Cardiac Coach is a free iPhone and Android app that offers a personalized recovery toolkit for heart attack survivors. Mobile users can find trustworthy information from leading CVD experts, blood pressure and weight progress trackers, tools to manage medications and log fitness, and a support network with opportunities to connect with other survivors directly from their smartphone or tablet. The brainchild of a leading team of biomedical engineers, physicians, computer engineers, and scientists at Evolve Medical Systems, Smart BP is an Apple and Android-friendly blood pressure management app that fosters a proactive approach to improving cardiovascular health. It works by syncing data from certain blood pressure monitoring devices to help users record and track results, and then shares them with their healthcare team. Watch a quick video on how the Smart BP app works here. A team at the American College of Cardiology launched the free CardioSmart Heart Explorer app for iPhone and Android to help enhance patient care and promote better communication about cardiovascular health. Through interactive graphics, animations, and engaging features, such as the “Bring to Life” option, the app clearly illustrates cardiovascular conditions and the potential effects of treatment at the touch of a button. 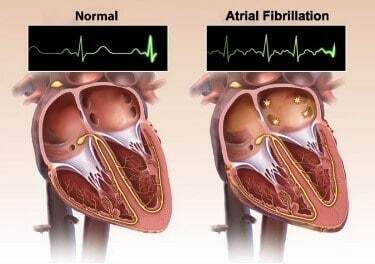 Watch the CardioSmart Heart Explorer demonstration video here. Conceived by two brothers following a family health scare when their father inadvertently administered too much insulin, Medisafe is a highly-rated medication management app that delivers personalized reminders when it’s time for a dose. It also provides critical drug interaction warnings, notifies you when medications refills are needed, can inform caregivers if a dose is missed, and sends drugstore coupons to participating retailers around the country. 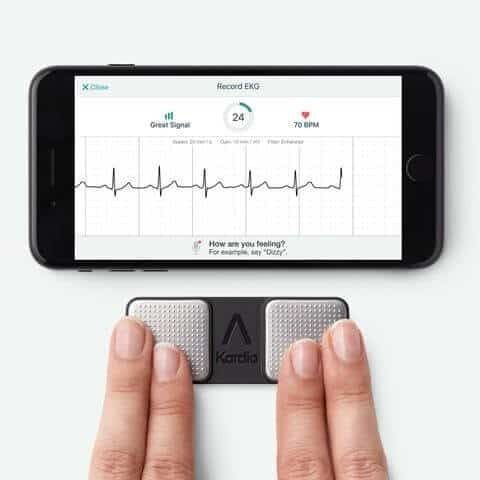 Cleared by the FDA, KardiaMobile is a compact, clinical grade EKG monitor that sends email-friendly results through its companion iOS and Android app in just 30 seconds – anytime, anywhere. This heart health app and gadget combination is available for $99 and is ideal for patients who have or may be at risk for atrial fibrillation, but it is not tested or recommended for those with a pacemaker or ICD. Designed for all people at any activity level, Pacer is a step tracking and fitness iPhone and Android app for heart health that aims to make exercising simple. Ideal for those who want to get more active, Pacer tracks activity, offers fitness plans and workout videos, and provides the opportunity to connect with others looking to boost their cardiovascular health. Find out what a Johns Hopkins cardiologist recommends for getting the most out of fitness trackers. Using professional input from an advisory board of experts in epidemiology, nutritional sciences, public health, and bariatrics, Fooducate developers launched this free heart health iPhone and Android app to help people eat better, lose weight, and get healthier. The Fooducate app tracks calories and activity, recommends healthy foods and recipes, fosters community discussions, and offers motivational food tips. With more studies suggesting that mindfulness techniques can protect against cardiovascular disease, meditation apps such as Calm and Insight Timer can help kickstart a daily routine. With both guided and self-guided options, as well as calming nature sounds and instrumentals, these heart health apps may help your patients discover life-changing relaxation tools that can lead to better health. While these apps and gadgets for heart heath are not intended to replace clinical care, and they require that patients feel motivated to use them regularly for best results, they can help reinforce and enhance your educational efforts – and that can lead to a heart-healthier future. For more articles to inspire your well-being and career, visit our blog today.